Flies can be a real problem if they are attracted to the moisture and compost of your houseplants. So use these easy to apply fly-catchers to solve the problem without having to resort to harmful sprays. - Protects plants against flying insects. - Control of flying pests, such as white fly, winged aphids, leaf miners & black fungus gnats. - Ready to use with odourless, insecticide - free adhesive which does not dry out & will not drip even at high temperatures. - Ideal for use on indoor plants. 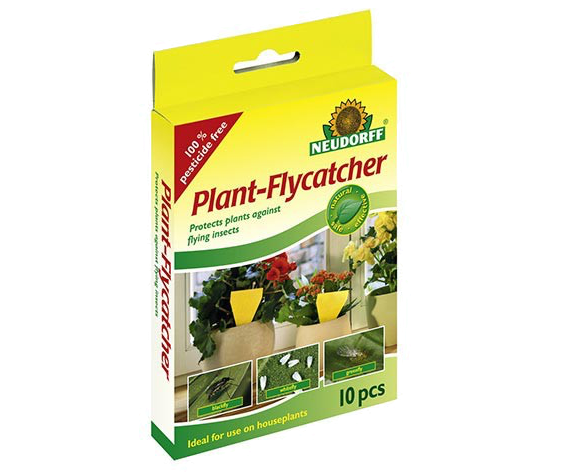 - Application: 1 plant flycatcher per infested plant. Place sticker in the soil next to plant. 10 Flycatchers per box.